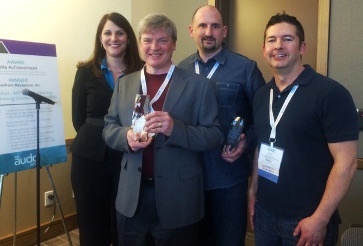 Austin, TX, February 24, 2015 – Gravitate Solutions, formerly Old Town IT, congratulates two of its clients – The Certified Financial Planner Board of Standards (the CFP Board) and The Association of Certified Fraud Examiners (ACFE) for receiving 2015 Abila Excellence Awards at the Abila User & Developer Conference held February 22 - 24 in Austin, TX. The CFP Board was awarded the “Moving the Needle” distinction for their efforts to create bundled Practice Exam products in netFORUM with an integration to their Internet Testing Systems (ITS) for seamless delivery and tracking of results. Gravitate Solutions, formerly Old Town IT, integrated CFP Board’s instance of netFORUM with ITS to provide a single sign-on experience for purchasing and taking the exam, leading to a 29% increase in the number of registrants signing up for the Practice Exam. ACFE was awarded the “Force for Good” distinction for creating a self-service portal for users to manage and submit their application materials to become Certified Fraud Examiners. Gravitate Solutions, formerly Old Town IT, helped ACFE leverage Abila’s netFORUM to create the portal that has since eased the candidate’s application process, eliminated paperwork, and drastically reduced staff time spent on manual application processes. “The CFP Board and ACFE are examples of leading associations that strive to offer their members the most innovative technology solutions. Gravitate Solutions, formerly Old Town IT, is proud to partner with these organizations and help them achieve their technology goals,” said Tim Ward, president and CEO of Gravitate Solutions. Certified Financial Planner Board of Standards, Inc. (CFP Board) was founded in 1985 as a 501(c)(3) non-profit organization that serves the public interest by promoting the value of professional, competent and ethical financial planning services, as represented by those who have attained CFP® certification. The ACFE is the world's largest anti-fraud organization and premier provider of anti-fraud training and education. Together with nearly 75,000 members, the ACFE is reducing business fraud worldwide and inspiring public confidence in the integrity and objectivity within the profession. The Abila Users and Developers Conference (AUDC) is an annual event uniting Abila users, partners and industry consultants with Abila executives, development and training resources. The Abila Excellence Awards recognize Abila’s nonprofit, association, and government customers who have shown exemplary achievement through the use of Abila products to help move their missions forward. Abila’s netFORUM is a membership management database with a comprehensive set of modules that integrate member data and business processes, allowing organizations to manage members, chapters, non-members and other relationships. 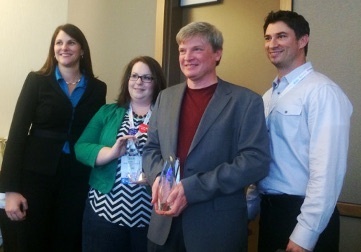 Tim Ward, President and CEO of Gravitate Solutions, formerly Old Town IT, was the chief architect of Abila’s netFORUM product suite during his 12-year tenure with the firm. Gravitate Solutions is an Abila Implementation Partner. For further information, contact Lindsey Swanson at (571) 357-6279 or lswanson@gravitatesolutions. Gravitate Solutions, formerly Old Town IT, specializes in software and product development for associations, member-based organizations, and nonprofits. Since 2007, Gravitate Solutions, formerly Old Town IT, has created innovative solutions and products for the business challenges unique to its clients. The company’s main offices are in Alexandria, Virginia and Springfield, Missouri.